I had a gum tissue graft surgery done on me last fall. It was the first dental treatment I had needed for a while. It was done by a colleague of mine, Dr. Stephen Reid, an excellent periodontist that I have known for a long time. The need for the treatment was that I have a lot of recession and the strong tissue needed to prevent further recession was missing on some teeth. The procedure involved removing some tissue from the palate and placing it next to those teeth that have recession. Dr. Reid did a couple of grafts on me more than 10 years ago and those have been very successful in preventing further recession and bone loss. Not many people enjoy going to the dentist and I can't say that I am any different, especially if it involves palatal injections and palatal surgery. But the procedure went very well and I had minimal pain. My treatment caused me to reflect on how we are influenced by our experiences and how my experiences have affected my philosophy of practice as a dentist. Growing up, I had no bad dental experiences (if I had, I am sure I would not have become a dentist). My oral hygiene as a kid wasn't too great and I ate a lot of sweets. I had a few cavities but for the most part I was lucky and had little decay. I went to the dentist regularly and had fluoride treatments. How do I think luck played a role? Well, my teeth were straight and didn't have a lot of grooves in them, making them easier to clean and less prone to decay. When I got to dental school, we did tests for bacteria in our saliva and I was found to have little of the main bacteria known to cause decay. To me, that was another explanation for my lack of decay. As an adult, my oral hygiene has been very good, at least since entering dental school. Just before entering dental school, I went to a dentist, who found a cavity between my teeth. He said it was small and was only in the enamel (the outer layer of the tooth). 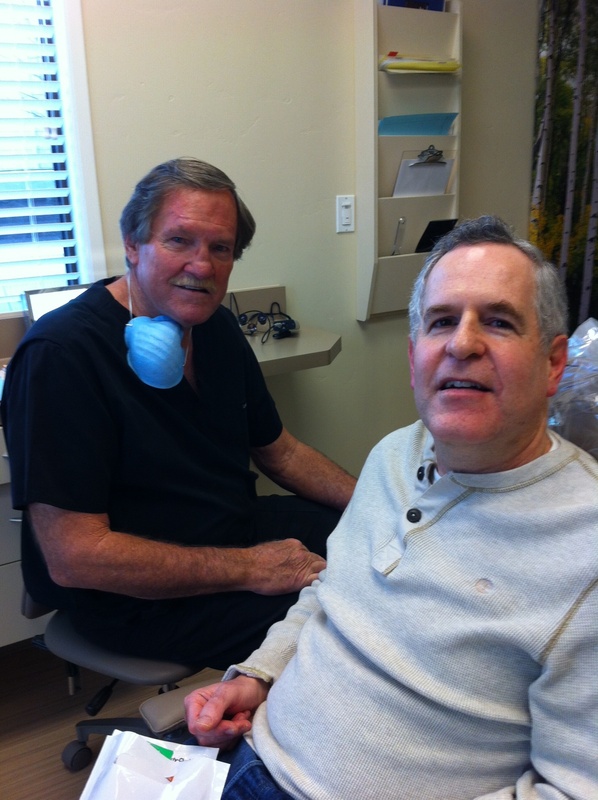 He advised me to floss daily and said that if it progressed, the cavity would need to be filled. Well, since that time, I have flossed nearly every day. That tooth has been x-rayed many times and the cavity has not gotten larger, even though it has been over 25 years! Small cavities between the teeth can become arrested and remineralize, if there is good oral hygiene. I knew this and learned it in dental school but nothing is more powerful than your own experience, which has influenced me in the way I practice dentistry, causing me to be very conservative in my approach. What about the recession and bone loss I have experienced? Why didn't good oral hygiene prevent them? Dr. Reid believes that I am one of the people susceptible to the bacteria that can cause bone loss. The treatment recommendation has been regular cleanings, good oral hygiene, antimicrobial rinses, and gum graft surgeries to prevent further recession. This has worked for me over the last 13+ years that I have seen Dr. Reid. My first grafts are over 12 years old and have prevented further recession. Dentistry, like medicine, is not an exact science. Sometimes one treatment that works on one person will not work well for another. I have seen a lot of things that have surprised me. I have seen people move here from other countries as adults that have never seen a dentist in their life and they have not had a single cavity. This is likely due to the lack of sugar in their diet when growing up. I have also seen patients come every 3 months to the dentist only to continue to have decay, even when controlling their diet. There are often multiple factors involved in causing dental problems, like teeth grinding or dry mouth caused by medications. For the most part, however, we know how to control dental disease. I wrote about some of this a few years ago in a blog I called “How to keep your dental bills low”. The last advice on the blog, visit your dentist and hygienist regularly, does sound self-serving but it is one thing guaranteed to lower your dental costs and dental problems over time. Thanks for this really interesting article! It's always fun to read about how dentists experience going to the dentist and then sharing about it like you have here. I can't even remember about my dental hygiene as a kid, although I'm lucky not to have any cavities right now. I always feel better after coming in to your office and knowing that I'm doing all I can to take of my teeth hygiene.